Blame it on spending my childhood in two countries. Blame it on bouncing back and forth between two languages. Between two cultures. I used to feel Thai and American. But never quite fully either one. It’s like being Abnegation and Dauntless. And being neither of them. Friends have been going to Thailand and posting pictures. I see the old haunts – Central and MBK and Swensen’s. Only I know what those mean. Street vendors selling farang (guava) and Coke in a bag, and then that other meaning of farang, which is what I am, and will always be there – foreigner. I know what a spirit house is, I know that you have to take the song taew to get to the bak soi and that you never take durian on an air conditioned bus. I know that a Thai will laugh if they don’t understand me, and vice versa. I know the stares and whispers at my white face, long nose, and curvy figure. I also know what it means to be loved by not your own kind. I’ve been here too long, now. I feel much more Americanized. But often I still don’t feel like I’m right for this place. When I was a teenager, it was hard to come back. I did not understand the American mind. What do I wear? What do I talk about? Why do they point their feet at their teachers? I rebelled against my own culture for a long time . . . until I just didn’t anymore. I never thought I wanted the American Dream, but now I’m living it. Eight years since I saw my old home. As I accumulate Apple products and enroll my children in classes and sports, focus on my career, I slowly forget the old ways, the old friends. The people who accepted a clumsy, nerdy white girl. I left them, and for my church friends, I left the church I helped bring to them and became Orthodox. How do I explain that now? I don’t think I can claim it anymore. At some point, maybe I let go of Thailand. And here I squirm around and feel like I have to keep up with the Joneses. I am constantly trying to fit in. Because I am afraid to not fit in. The last time I was in Thailand, I visited Phuket. While there, I had my hair braided in those little beads. The next morning, my wavy, coarse hair had started poking out of the braids. So went back to the hair place and they re-braided sections, assuring me my hair would hold this time. But it didn’t. It’s how I feel, sometimes – I keep trying to stuff myself into some mold that doesn’t exactly fit me right. While in Phuket, I was asked if I wanted to visit the spot where Will died. I didn’t. 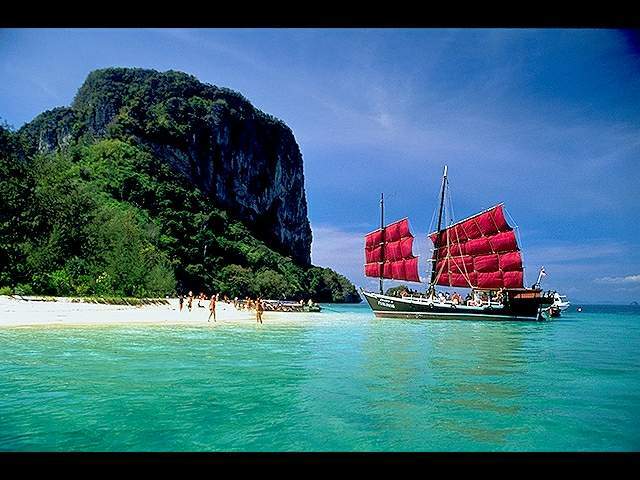 It was enough to be there, on the beach, swimming out in that gorgeous water, the oceans of Thailand that we so loved. I think Will understands. His spirit was there, in a mystical way. He was joyous there. But he’s here too, when I visit his grave and when I celebrate Pascha (Easter) and when I hold him close in my heart. Maybe the old cliche is right: Home is where the heart is. Karissa – Sometimes I feel that even between here and Santa Barbara! Thanks for sharing that beautiful poem – I’ve never read it and I love it. Amanda, I’m sure you do! I’ve been to CA and it’s a very different place! I’m glad you’re in TN though. Thank you for taking the time to write what is in your heart. It took me years to figure out why I felt the way I felt. Half of me feels american and the other guatemalan. The part about trying to fit in rang so true. I’m just now in my 30’s learning to let go of all that and just be myself. It’s a process. I love that about you! We have to embrace all of our identities and histories – they all make us who we are. I have no idea how I stumbled upon your site, but I am sitting here, stunned, reading this. I grew up in Chiang Mai. I just wrote about this on another site and I am completely floored by your writing. I’m 26 and probably grew up in a different era, but I could’ve written this exact same post. I’ve had the hardest time identifying my cultural roots and the closet thing I’ve come to is this guest post I wrote on D.L. Mayfield’s blog. By the way, your blog is stunning. Briana, nice to meet a fellow MK from Thailand. Did you go to CMIS? Did you by chance know the Yangmi family? Lovely, lovely post over at D.L. Mayfield. So true. Your blog looks wonderful, too.